Single or multiple gunshot to pelvis causes penetration of bullets into pelvic bone and pelvic cavity. The complications observed following pelvic gunshot injury depends on extent of injury of pelvic bones and organs that lies within pelvic cavity. 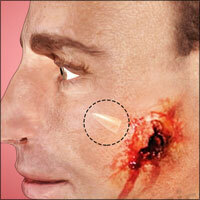 Gunshot wounds to the face pose a serious threat to the face, head and neck structures and demands careful attention. Facial fractures due to gunshot may be managed by surgical methods like closed reduction, external fixation, internal fixation, open reduction and internal stable fixation (ORIF). Know what kind of hip and pelvis injuries can be caused by gunshot, its management, and treatment. This article explains the impact of gunshot wound to the knee, knee injuries caused by bullets, and treatment of penetrating knee injury due to gunshot. Gunshot wounds to hand are also a common presentation at trauma centers. The common hand injuries due to gunshot involve fracture of bones of the hand and small bones of the fingers, bone instability, bone loss, soft tissue injuries to the muscles and related structures, tendon and ligament injury and in some cases damage to the nerve or blood vessels may be noticed. Gunshot wound to the chest is challenging owing to the presence of vital organs like lungs, heart etc. Common injuries like open chest wounds (sucking chest wounds) can result due to large wound in the chest wall. Know its complications, treatment and prognosis. Gunshot wounds to shoulders can range from the area below the neck extending up to the shoulders and upper arms. The shoulder joint has many structures involved and gunshot wounds can cause varying degrees of injury. Know its treatment and prognosis. Gunshot wounds to the abdomen are common, which usually involve abdominal structures like small intestine, colon, liver and other abdominal blood vessels. Know the evaluation and assessment, treatment and prognosis of penetrating gunshot abdominal wounds. Gunshot wounds causing trauma to the head is one of the most fatal firearm injuries. The victim may present with brain swelling, hemorrhage, cerebral ischemia and increased intracranial pressure. Outcome and recovery from brain injury due to gunshot wound is variable.